The case, dubbed Operation North Coast, culminated in March 2016 with the execution of search warrants, arrest warrants and dozens of simultaneous interviews, according to a press release from ODNR. The case primarily concerned the illegal taking and sales of Lake Erie sportfish and white-tailed deer meat products in counties along the Lake Erie shoreline. Since the takedown, state wildlife investigators have spent 2.5 years attending court hearings in Cuyahoga, Lorain, Lucas, Richland, Ottawa and Wood counties. Following the initial search warrants and interviews, state wildlife investigators reviewed thousands of documents, conducted approximately 200 interviews, executed additional search warrants, examined hundreds of digital and physical evidence items that were seized and attended approximately 100 court hearings. Of the items seized were one vehicle, 96 deer and turkey mounts, 35 sets of antlers, more than 200 pounds of filleted sportfish and 400 pounds of de-boned venison and processed deer meat. Nine defendants, including one in Wood County and eight in Cuyahoga County, were subsequently charged with engaging in a pattern of corrupt activity and associated crimes for operating as a criminal enterprise. The ODNR Division of Wildlife asserted that members of the group took deer illegally, often not tagging or reporting the harvests as required by law. The group would also create false harvest records by checking deer in the names of others to cover illegally taken deer meat and/or antlers. The agency further asserted that the deer meat was laundered into venison “smokies” that were sold or bartered for taxidermy and other services. According to ODNR, the group would have their spouses and family members commit communications fraud and falsify records in the ODNR Division of Wildlife’s game check system. The deer were then de-boned and transferred to Zayac, who would take the de-boned venison to Smokin’ T’s, a meat processor in Ashtabula County, for processing. During the scope of the case, approximately 2,000 pounds of boneless venison were taken to Todd Neczeporenko, who owns Smokin’ Ts meat processing, according to ONDR. According to Law Enforcement Program Administrator Ronald L. Ollis, Smokin’ T’s was indicted in racketeering charges as part of a criminal enterprise in the act of laundering as the business took boneless deer meat, converted it into venison products illegally and was getting a lot more deer meat than the business had tags to cover. The boneless products were then sold by members of the enterprise, primarily Zayac. The racketeering cases in Cuyahoga County Common Pleas Court were the last to conclude in late 2018. The following penalties were assessed by the Honorable Judge Michael Donnelly in plea agreements. John Zayac paid $40,000 in restitution, had his hunting privileges revoked for seven years, forfeited a truck and 44 of the 54 seized deer mounts were forfeited to the ODNR Division of Wildlife. John Stofan was ordered to pay $25,000 in restitution, lost his hunting privileges for five years and 31 of the 35 deer mounts were forfeited to the ODNR Division of Wildlife. Terrence Ankrom was ordered to pay $6,800 in restitution, forfeited a truck and lost his hunting privileges for five years. Todd Neczeporenko’s business, changed to Ohio Farms LLC in the indictment, pleaded to a lesser charge of “state of ownership of and title to wild animals - prohibited activities,” and was ordered to pay $15,000 in restitution. The remaining counts were nolled. When questioned on the results of the case, Cuyahoga County Attorney Kevin Spellacy, speaking on Neczeporenko’s behalf, said he felt the ODNR investigation was about the camouflage, went from first-degree felonies to a third-degree misdemeanor, and at the end of the day the facts didn’t justify what they thought they investigated. “Court documents reflect that Ohio Farms LLC received one misdemeanor and paid a fine, but Smokin’ T’s with myself was dismissed,” said Neczeporenko additionally. The following information is from the ODNR press release. 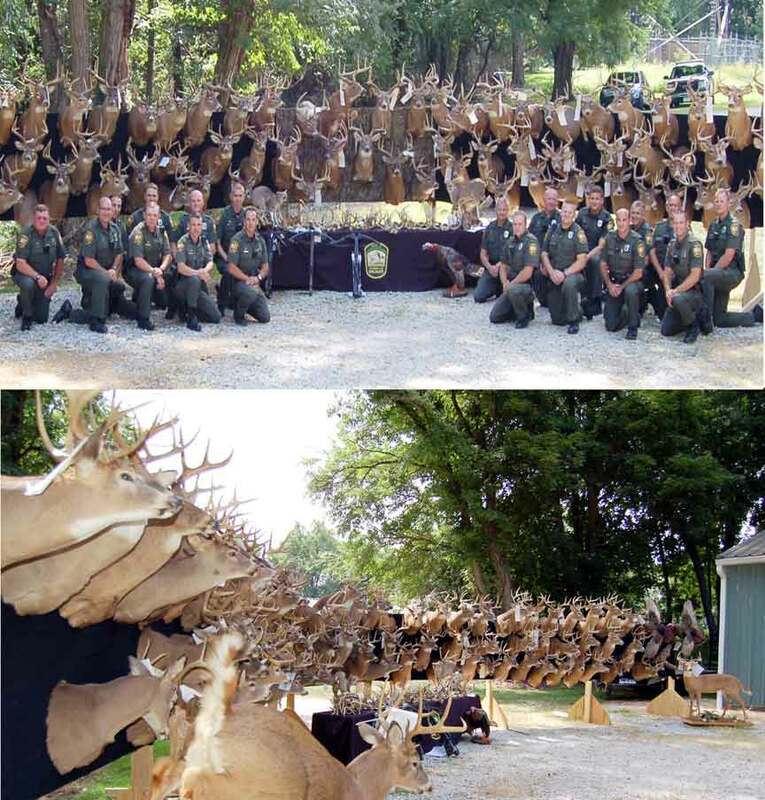 Items forfeited to the ODNR Division of Wildlife included three vehicles; approximately 100 deer mounts and antlers/skull plates; taxidermy mounts of turkeys, two bobcats, an owl and chipmunks; freezers containing hundreds of pounds of de-boned and processed venison; crossbows; fishing cleaning equipment; and meat processing equipment.